FACT CHECK: Do Opossums Kill Ticks, Inhibit the Spread of Lyme Disease? Do Opossums Kill Ticks, Inhibit the Spread of Lyme Disease? A popular meme asserted opossums kill most deer ticks they encounter and thus inhibit the spread of Lyme disease to humans. Opossums kill thousands of ticks each week, inhibiting the spread of Lyme Disease to humans. Some data indicate opossums eat thousands of deer ticks per season, reducing the number that can go on to spread Lyme Disease to humans. How much of an impact opossums' eating ticks has on Lyme Disease infection rates is indeterminate. Given the frequently absurd nature of “amazing facts” memes, many viewers were rightly skeptical of the claim attached to that photograph. The image provided no citations to substantiate the information it presented, and the notion that opossums were a possible tool in the epidemiological battle against Lyme disease seemed implausible to some. [N]ow ecologists have learned something else about opossums. They’re a sort of magnet when it comes to riding the world of black-legged ticks, which spread Lyme disease. “Don’t hit opossums if they’ve playing dead in the road,” said Richard Ostfeld, of the Cary Institute for Ecosystem Studies in Millbrook, N.Y.
Ostfeld is forest ecologist and an expert on the environmental elements of infectious diseases like Lyme disease. Several years ago, scientists … tested six species — white-footed mice, chipmunks, squirrels, opossums and veerys and catbirds — by capturing and caging them, and then exposing each test subject to 100 ticks … [O]f the six, the opossums were remarkably good at getting rid of the ticks — much more so that any of the others. [A]mong other opossum traits, there is this: They groom themselves fastidiously, like cats. If they find a tick, they lick it off and swallow it … Extrapolating from their findings, Ostfeld said, the team estimated that in one season, an opossum can kill about 5,000 ticks … Some ticks end up getting their blood meal from the possum. But more than 90 percent of them ended up being groomed away and swallowed. “They’re net destroyers of ticks,” Ostfeld said. Because many ticks try to feed on opossums and few of them survive the experience. Opossums are extraordinarily good groomers it turns out — we never would have thought that ahead of time — but they kill the vast majority — more than 95% percent of the ticks that try to feed on them. 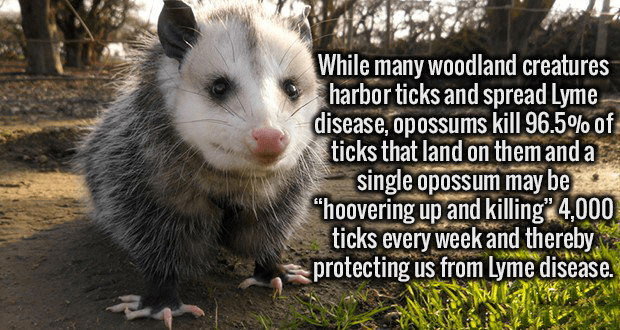 So these opossums are walking around the forest floor, hoovering up ticks right and left, killing over 90% of these things, and so they are really protecting our health. By subjecting field-caught hosts to parasitism by larval blacklegged ticks, we found that some host species (e.g. 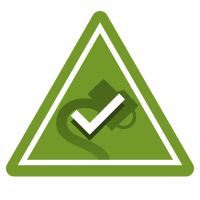 opossums, squirrels) that are abundantly parasitized in nature kill 83–96% of the ticks that attempt to attach and feed, while other species are more permissive of tick feeding. [T]he vast majority (96.5%) of larval ticks that encounter an opossum and attempt to feed are apparently consumed. Working backwards, [we calculate that] during any given week in the larval activity peak, each opossum must host more than 5500 larval ticks to produce 199 that successfully feed. By this logic, during the larval peak, each mouse encounters approximately 50 larval ticks per week, almost half of which feed to repletion and become nymphs. As far as “amazing facts” images go, the opossum/Lyme disease one was very well researched, with numbers that matched up with what ecologists have learned about opossums, deer ticks, and the spread of Lyme disease in recent years (although those studies surmised opossums kill approximately 5,000 ticks per season, not per week).